The families of two men who were abducted, murdered and secretly buried by the IRA are making funeral arrangements after DNA tests were completed. 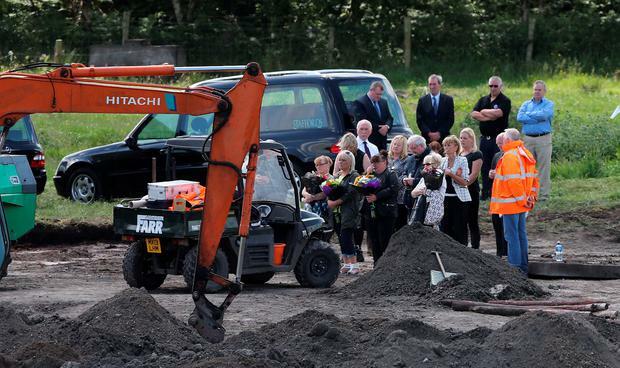 The bodies of Seamus Wright and Kevin McKee were recovered from a shallow grave on reclaimed bogland in June, during a dig to find a third man killed and disappeared by the Provos. Tests on the remains have been ongoing throughout the summer, with Independent Commission for the Location of Victims' Remains (ICLVR) confirming they had been formally identified. The men were unearthed on a farm near Coghalstown, Co Meath, after laying undisturbed for about 40 years in a shallow grave - one body on top of the other. The ICLVR was on site for several months this year searching for the remains of former Cistercian monk Joe Lynskey, also a victim of the IRA. Searches for Mr Lynskey have been unsuccessful to date.